La Verne, CA – Nov 7, 2006 — Maha Energy, the maker of Powerex batteries and chargers, is pleased to announce its most significant product in five years: MH-C9000 WizardOne Battery Charger & Analyzer. Suitable for the casual consumer users, enthusiast and professionals, WizardOne is capable of charging, conditioning, analyzing, cycling, forming and discharging one to four AA or AAA batteries, all while digitally displaying the battery capacity and voltage. All four slots can be operated independently in different modes and settings. A total of five modes are available. Those seeing the unit for the first time will be struck by its large LCD screen, backlit by ultra-bright white LEDs. Measuring over 3.5」 by 1.5」, the display is more than three times larger than its closest competition and shows a wealth of information that is easy to read. 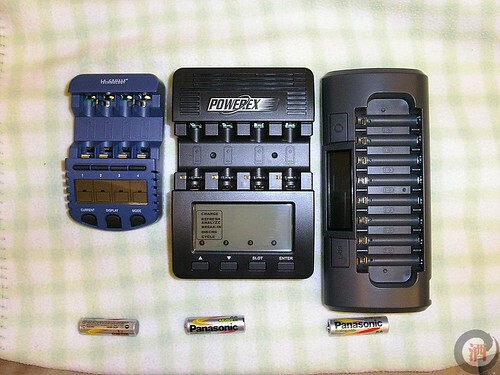 Charge, condition and analyze one to four AA or AAA batteries. Independent operation of each slot. Discharge: Discharge the battery at the selected rate. Analyze & Refresh: First charge the battery at the selected rate, then discharge it at the selected rate followed by recharging. The discharge capacity is saved for display at the end of the cycle. Break-In: Allows user to enter the battery capacity and performs a forming charge at 0.1C for 16 hours (using only temperature and timer cutoff) followed by discharge and medium rate recharge. Cycle: Allows user to set charge and discharge rate and number of cycle to perform. Will save capacity up to 15 cycle which user can access throughout the cycling. Four independent thermocouples to manage battery temperature. Quartz-oscillator time base for 1% repeatability in capacity calculations. 12V input and can be powered by an optional car adapter. Built-in 「lift rod」 to raise the charger to improve air flow below the unit. MH-C9000 will ship in December 2006 with a MSRP of $69.95. The standard package will include a worldwide travel power supply. A 12V car adapter is available as an option.